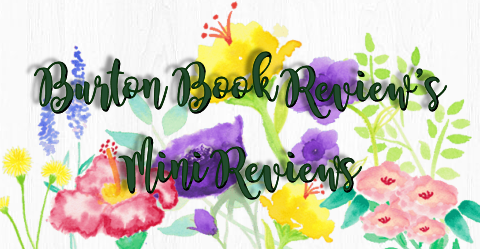 Please visit the main Round Table page to follow the links for all of the events we have for the HF Bloggers Round Table: Claude and Camille by Stephanie Cowell. 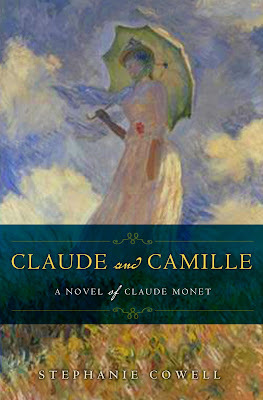 As portrayed in Stephanie Cowell's new novel, Camille Doncieux was Claude's first true love. She was a Parisian girl with a bright future, yet she set her stars on the then unsuccessful Claude Monet. They struggled together throughout her lifetime to make ends meet, and she seemingly did it with style and grace just to be by Claude's side, against both of their parent's wishes. 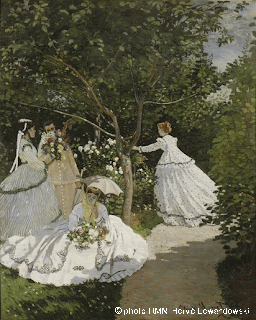 Women in the Garden was painted as Camille modeled as all the ladies for Monet in Sèvres, a commune in the southwestern suburbs of Paris, France. 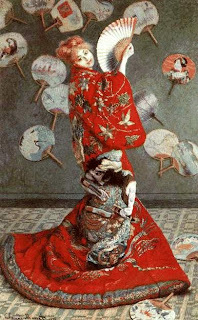 She posed for several of these styles of domestic scenes for Claude, and also donned a wig for the La Japonaise painting in 1876. This became the last large scale portrait he did of her. 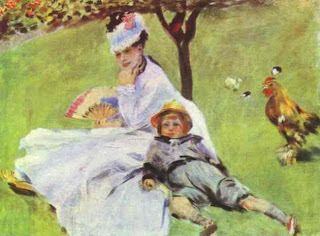 Auguste Renoir was a fellow artist friend and he painted Camille as she read La Figaro on the couch in 1872, and a few years later he painted Camille with her son, Jean Monet. Throughout Stephanie Cowell's book, Monet seems to be struggling with the very idea of who was Camille? Claude Monet painted his muse many many times after meeting her in 1866. Camille Doncieux was his muse, and she only became his wife three years after giving birth to their first son. Camille was born in Lyon in 1847. Sadly though, she died not too long after their second son was born. 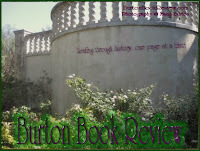 In Cowell's novel, Camille is portrayed as a woman with a vigor for life, and with a zest for creative outlets such as dramas, acting and writing. 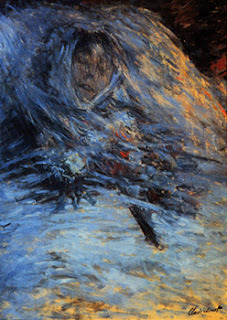 The death scene is not how she would have wanted to be remembered, and Monet may have known that which is why the death painting remained hidden for many years until his son allowed it to be viewed, years after Monet's own death. Monet kept a portrait of Camille in his bedroom for the rest of his life. Camille probably would have liked to be remembered as the charming young woman who was Monet's muse. She enjoyed being known for the model as The Lady in the Green dress, the one in which Cowell tells us is the first painting Monet painted of her when she was nineteen years old. It was a large painting, and was accepted to the annual painting exhibition, the Salon, in Paris, the first major achievement for Monet. It would be fantastic if there were a wealth of information on her, but it seems she is to remain an enigma. I am eager to read a new book coming later this summer titled Monet and His Muse: Camille Monet in the Artist's Life, written by Mary Mathews Gedo. I visited the Dallas Museum of Art and was lucky that this month featured the exhibit of The Lens of Impressionism: Photography and Painting Along the Normandy Coast, 1850–1874. I was awe-inspired to be standing so close to paintings by Claude Monet, Eugène Boudin, Edouard Manet, Degas and many others. It was a fantastic visit. A few of Monet's earlier works were there. In one of the Monet's there was a portrayal of a hotel, which is where Camille and Claude honeymooned in 1870, Hotel des Roches Noires in Trouville. The painting depicts an American Flag, which is quite unusual in Monet's paintings. 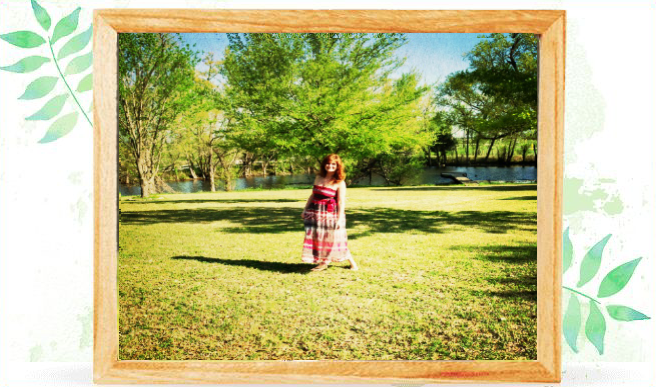 See the image here, the picture loader is not working at this moment. Is Camille in this painting? The couple vacationed with their friends as well during this honeymoon in Trouville. In my search for Camille, I made the following compilation which includes both Monet and Renoir paintings of Camille. I included the Auguste Renoir paintings because the show a more vivid likeness of Camille, as opposed to Monet's own very impressionistic style, with the wider strokes of the brush. See the main site for a full list of this week's events, which conclude April 13th. 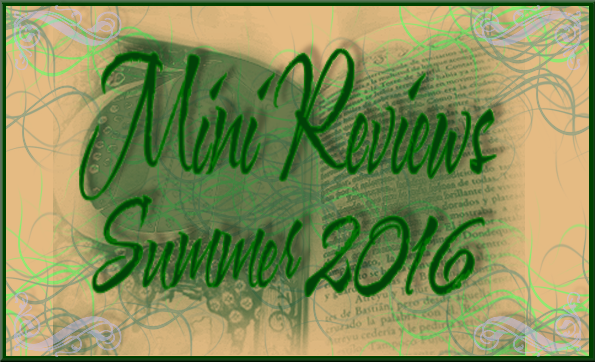 Be on the lookout for special Monet-themed giveaways around the blogs as well.